Get on your bike...Ride the Lights!! 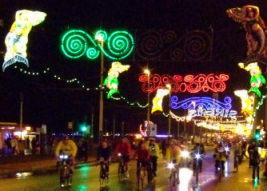 - An exciting preview of Blackpool Illuminations. Ride at any point along the promenade from Starr Gate at South Shore to Red Bank Road in Bispham. You can ride as much or as little of the route as you are able. Ride the lights is not a bike race, it's a fun and FREE bike ride open to all. A great opportunity to get out and about on your bike with both family and friends.